This article is a revised and extended version of a keynote address delivered at the Fifteenth National Conference on Economics of the Brazilian Political Economy Society (SEP), Federal University of Maranhão, São Luis, June 3, 2010. The author would like to thank Fred Magdoff for his assistance. To be sure, finance has always played a central, even indispensable, role in capital accumulation. Joseph Schumpeter referred to the creation of credit ad hoc as one of the defining traits of capitalism. “The money market,” he added, “is always…the headquarters of the capitalist system.”4 Yet something fundamental has changed in the nature of capitalism in the closing decades of the twentieth century. Accumulation—real capital formation in the realm of goods and services—has become increasingly subordinate to finance. Keynes’s well-known fear that speculation would come to dominate over production seems to have finally materialized. Indeed, since the 1970s we have witnessed what Kari Polanyi Levitt appropriately called “The Great Financialization.”6 Financialization can be defined as the long-run shift in the center of gravity of the capitalist economy from production to finance. This change has been reflected in every aspect of the economy, including: (1) increasing financial profits as a share of total profits; (2) rising debt relative to GDP; (3) the growth of FIRE (finance, insurance, and real estate) as a share of national income; (4) the proliferation of exotic and opaque financial instruments; and (5) the expanding role of financial bubbles.7 In 1957 manufacturing accounted for 27 percent of U.S. GDP, while FIRE accounted for only 13 percent. By 2008 the relationship had reversed, with the share of manufacturing dropping to 12 percent and FIRE rising to 20 percent.8 Even with the setback of the Great Financial Crisis, there is every indication that this general trend to financialization of the economy is continuing, with neoliberal economic policy aiding and abetting it at every turn. The question therefore becomes: How is such an inversion of the roles of production and finance to be explained? In any attempt to address the role of finance in the modern economy, the work of John Maynard Keynes is indispensable. This is especially true of Keynes’s achievements in the early 1930s when he was working on The General Theory of Employment, Interest and Money (1936). It is here, in fact, that Marx figures centrally in Keynes’s analysis. In 1933 Keynes published a short piece called “A Monetary Theory of Production,” which was also the title he gave to his lectures at the time. He stressed that the orthodox economic theory of exchange was modeled on the notion of a barter economy. Although it was understood that money was employed in all market transactions under capitalism, money was nonetheless “treated” in orthodox or neoclassical theory “as being in some sense neutral.” It was not supposed to affect “the essential nature of the transaction” as “one between real things.” In stark opposition, Keynes proposed a monetary theory of production in which money was one of the operative aspects of the economy. In dealing with exchange or the metamorphosis of commodities, he [Marx] first treated C-M-C (Commodity for Money for Commodity). Such an exchange he considered no different in principle from barter since the object of exchange was to transfer a commodity of little or no utility to its possessor for a different commodity of high utility, and money entered in as a convenient medium to effect the transaction. The double transaction indicated no exploitation, for the assumption was that in each transaction there was an exchange of equivalent values, or quantities of embodied labor, so the final commodity had neither more nor less value than the original commodity, but had a higher utility for the recipient. Thus the metamorphosis C-M-C represented an exchange of equivalent values and no exploitation…. was approaching the intermediate truth when he added that the continuous excess of M′ would be inevitably interrupted by a series of crises, gradually increasing in intensity, or entrepreneur bankruptcy and underemployment, during which, presumably, M [as opposed to M′] must be in excess. My own argument, if it is accepted, should at least serve to effect a reconciliation between the followers of Marx and those of Major Douglas [a leading British underconsumptionist], leaving the classical economists still high and dry in the belief that M and M′ are always equal! Marx and Keynes both rejected, as we have seen, the rigid separation of the real and the monetary that characterized orthodox economic theory. A monetary theory of production of the sort advanced, in somewhat different ways, by both Marx and Keynes led naturally to a theory of finance as a realm not removed from the workings of the economy, but integrated fully with it—hence, to a theory of financial crisis. Decisions on whether (or where) to invest today in this conception—as developed by Keynes, in particular—were affected by both expected profits on such new investment and by the speculative demand for money and near money (credit) in relation to the interest rate. The growing centrality of finance was a product of the historical development of the system. During the classical phase of political economy, in capitalism’s youth, it was natural enough that economic theory would rest on the simple conception of a modified barter economy in which money was a mere means of exchange but did not otherwise materially affect basic economic relations. By the late nineteenth century, however, there were already signs that what Marx called the “concentration and centralization of production,” associated with the emergence of the giant corporation, was giving rise to the modern credit system, based on the market for industrial securities. We can picture this dialectic of production and finance, following Hyman Minsky, in terms of the existence of two different pricing structures in the modern economy: (1) the pricing of current real output, and (2) the pricing of financial (and real estate) assets. More and more, the speculative asset-pricing structure, related to the inflation (or deflation) of paper titles to wealth, has come to hold sway over the “real” pricing structure associated with output (GDP).23 Hence, money capital that could be used for accumulation (assuming the existence of profitable investment outlets) within the economic base is frequently diverted into M-M′, i.e., speculation in asset prices.24 Insofar as this has taken the form of a long-term trend, the result has been a major structural change in the capitalist economy. Keynes’s own argument was therefore quite different from the theory that we have become accustomed to via Minsky. He stressed that the stagnation tendency—or the decline in expected profit on new investment in a capital-rich economy—served to increase the power of money and finance. Thus, for Keynes, Minsky noted, “Money rules the roost as the expected yield of real assets declines.”33 As Keynes put it: “Owing to its accumulation of capital already being larger” in a mature, capital-rich economy, “the opportunities for further investment are less attractive unless the rate of interest falls at a sufficiently rapid rate.” The uncertainty associated with the tendency of expected profit on new investment to decline gave an enormous boost to “liquidity preference” (or as Keynes also called it “the propensity to hoard” money) and to financial speculation as an alternative to capital formation, compounding the overall difficulties of the economy. The second strand, in which Baran and Sweezy’s Monopoly Capital is undoubtedly the best known example, centered on the growing monopolization in the modern economy, that is, “the tendency of surplus to rise” in an economy dominated by the giant firm, and the negative effects this had on accumulation. Speculative finance increasingly took on a life of its own. Although in the prior history of the system financial bubbles had come at the end of a cyclical boom, and were short-term events, financialization now seemed, paradoxically, to feed not on prosperity but on stagnation, and to be long lasting.42 Crucial in keeping this process going were the central banks of the leading capitalist states, which were assigned the role of “lenders of last resort,” with the task of bolstering and ultimately bailing out the major financial institutions whenever necessary (based on the “too big to fail” principle). “In an era of finance,” Toporowski writes, “finance mostly finances finance.”44 Hence, production in recent decades has become increasingly “incidental to the much more lucrative business of balance-sheet restructuring.” With the big motor of capital accumulation within production no longer firing on all cylinders, the emergency backup engine of financial expansion took over. Growing employment and profit in the FIRE sector helped stimulate the economy, while the speculative growth of financial assets led to a “wealth effect” by means of which a certain portion of the capital gains from asset appreciation accruing to the well-to-do were funneled into increased luxury consumption, thereby stimulating investment. Even for the broad middle strata (professionals, civil servants, lower management, skilled workers), rapid asset price inflation enabled a large portion of employed homeowners to consume through new debt the apparent “capital gains” on their homes.45 In this manner, the expansion of debt raised asset prices, which in turn led to a further expansion of debt that raised asset prices, and so on: a bubble. This analysis of how financialization has heightened the disparities in income, wealth, and power helps us to put into perspective the view, now common on the left, that neoliberalism, or the advent of extreme free-market ideology, is the chief source of today’s economic problems. Instead, neoliberalism is best seen as the political expression of capital’s response to the stagnation-financialization trap. So extreme has the dominant pro-market or neoliberal orientation of monopoly-finance capital now become that, even in the context of the greatest economic crisis since the 1930s, the state is unable to respond effectively. Hence, the total government-spending stimulus in the United States in the last couple of years has been almost nil, with the meager federal stimulus under Obama negated by deep cuts in state and local spending.50 The state at every level seems to be stopped in its tracks by pro-market ideology, attacks on government deficits, and irrational fears of inflation. None of this makes any sense in the context of “what,” to quote Paul Krugman, “looks increasingly like a permanent state of stagnation and high unemployment.”51 The same basic problem is evident in the other advanced capitalist countries. Never before has the conflict between private appropriation and the social needs (even survival) of humanity been so stark. Consequently, never before has the need for revolution been so great. In place of a global system given over entirely to monetary gain, we need to create a new society directed at substantive equality and sustainable human development: a socialism for the twenty-first century. ↩ Karl Marx, Capital, vol. 3 (London: Penguin, 1981), 607-08. ↩ Paul M. Sweezy, “More (or Less) on Globalization,” Monthly Review 49, no. 4 (September 1997): 3. Globalization was, in Sweezy’s view, a much longer and wider phenomenon, characteristic of all stages of capitalism’s historical development, and hence not an outgrowth of changing modes of accumulation. ↩ The term “the enigma of capital” is taken from David Harvey, The Enigma of Capital (London: Profile Books, 2010). Although Harvey does not use the term in precisely this way, the approach outlined here is generally in accord with the outlook in his latest book. ↩ Joseph A. Schumpeter, The Theory of Economic Development (New York: Oxford University Press, 1961), 107, 126, and Essays (Cambridge, Mass. : Addison-Wesley, 1951), 170. ↩ The drop in investment in the crisis is reflected in the fact that in 2009 the total capital stock of business equipment in the United States dropped by 0.9 percent from 2008, its first decline since the 1940s; meaning that firms did not even spend enough on new equipment to offset the wear and tear on their existing equipment. “Firms Spend More—Carefully,” Wall Street Journal, August 11, 2010. ↩ Kari Polanyi Levitt, “The Great Financialization,” John Kenneth Galbraith Prize Lecture, June 8, 2008, http://karipolanyilevitt.com/documents/The-Great-Financialization.pdf. ↩ For evidence of these trends, see John Bellamy Foster and Fred Magdoff, The Great Financial Crisis (New York: Monthly Review Press, 2009). It should be noted that this usage of the term “financialization,” as related to a secular trend in today’s economy, is quite different from its usage in the work of world-system theorists such as Giovanni Arrighi and Beverly Silver, who basically refer to it as a phase in the hegemonic cycles of the capitalist world-system. See Giovanni Arrighi and Beverly J. Silver, Chaos and Governance in the Modern World System (Minneapolis: University of Minnesota Press, 1999), 213. ↩ Robert E. Yuskavage and Mahnaz Fahim-Nader, “Gross Domestic Product by Industry for 1947-86,” Bureau of Economic Analysis, Survey of Current Business, December 2005, 71; U.S. Census Bureau, The 2010 Statistical Abstract, Table 656, “Gross Domestic Product by Industry and State: 2008”; Kevin Phillips, Bad Money (New York: Viking, 2008), 31. ↩ John Maynard Keynes, “A Monetary Theory of Production,” in Keynes, Collected Writings, vol. 13 (London: Macmillan, 1973), 408-11. 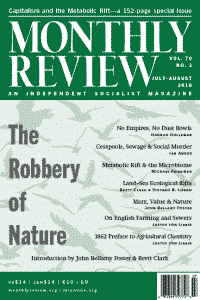 As Kenneth Arrow put it: “The view that only real magnitudes matter can be defended only if it is assumed that the labor market (and all other markets) always clear, that is, that all unemployment is essentially voluntarily.” Kenneth, J. Arrow, “Real and Nominal Magnitudes in Economics,” Journal of Financial and Quantitative Analysis 15, no. 4 (November 1980): 773-74. ↩ John Maynard Keynes, Collected Writings, vol. 29 (London: Macmillan, 1979), 81-82. See also Dudley Dillard, “Keynes and Marx: A Centennial Appraisal,” Journal of Post Keynesian Economics 6, no. 3 (Spring 1984), 421-24. ↩ Keynes, Collected Writings, vol. 13, 89. ↩ When Sweezy wrote to Keynes’s younger colleague Joan Robinson in 1982 about the publication of Keynes’s 1930s lecture notes in which he discussed Marx, asking if she had any additional knowledge of this, she replied: “I was also surprised at the note about Keynes and Marx. 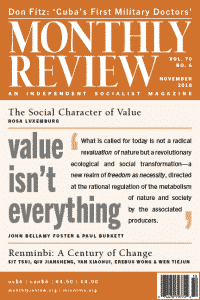 Keynes said to me that he used to try to get Sraffa to explain to him the meaning of labor value, etc., and recommend passages to read, but that he could never make out what it was about.” Quoted in Paul M. Sweezy, “The Regime of Capital,” Monthly Review 37, no. 8 (January 1986): 2. ↩ Harlan Linneus McCracken, Value Theory and Business Cycles (Binghampton, New York: Falcon Press, 1933), 46-47. ↩ Keynes to McCracken, August 31, 1933, in Steven Kates, “A Letter from Keynes to Harlan McCracken dated 31st August 1933: Why the Standard Story on the Origins of the General Theory Needs to Be Rewritten,” October 25, 2007, Social Science Research Network, Working Paper Series, http://ssrn.com/abstract=1024388. ↩ Keynes, Collected Writings, vol. 29, 81-82. Some will recognize this as the basis for Keynes’s later allusion in The General Theory to “the underworlds of economics” in which “the great puzzle of effective demand” has its “furtive“ existence—and where mention is made of Marx, Hobson, and Douglas. On this, see Keynes, The General Theory of Employment, Interest and Money in Keynes, Collected Writings, vol. 7 (London: Macmillan, 1973), 32, 355, 364-71. In referring favorably in his lectures to the American underconsumptionists William T. Foster and Waddill Catchings, Keynes was clearly influenced by McCracken’s chapter on these thinkers. See McCracken, Value Theory and Business Cycles, 157-68. ↩ Keynes, Collected Writings, vol. 13, 420. See also Donald Moggridge, “From the Treatise to the General Theory: An Exercise in Chronology,” History of Political Economy 5, no. 1 (Spring 1973), 82. ↩ Sweezy, “The Regime of Capital,” 2. ↩ Karl Marx, Theories of Surplus Value, Part 2 (Moscow: Progress Publishers, 1968), 509-15. For a good rendition of the overlap of the analysis of Marx and Keynes in this area, see Peter Kenway, “Marx, Keynes, and the Possibility of Crisis,” Cambridge Journal of Economics 4 (1980): 23-36. ↩ Marx, Capital, vol. 3, 515. ↩ Marx, Capital, vol. 3, 607-610, 707; Karl Marx and Frederick Engels, Selected Correspondence (Moscow: Progress Publishers), 396-402; Jan Toporowski, Theories of Financial Disturbance (Northampton, Mass. : Edward Elgar, 2005), 54. For a detailed description of Marx’s theory of “fictitious capital” see Michael Perelman, Marx’s Crises Theory (New York: Praeger, 1987), 170-217. ↩ Hyman P. Minsky, John Maynard Keynes (New York: Columbia University Press, 1975), 72-73. ↩ Harry Magdoff and Paul M. Sweezy, Stagnation and the Financial Explosion (New York: Monthly Review Press, 1987), 94-95. The distinction between production and finance, as representing base and superstructure, should not, of course, be confused—Magdoff and Sweezy argued—with the wider, all-encompassing base-superstructure metaphor of historical materialism. Both sets of relations and processes, to which the base-superstructure metaphors refer, must alike be understood as dialectical. The historical emergence of finance from production gives no warrant for reductive explanations of how the structured process functions (or malfunctions) today. This is an error exactly parallel to a frequent, crude misunderstanding of the base-superstructure metaphor of historical materialism by the critics of Marxism. See István Mészáros, Social Structure and Forms of Consciousness, vol. 2 (New York: Monthly Review Press, forthcoming), chapter 1. Thus, it is a mistake to argue reductionistically, as even some Marxists theorists have, that “the financial cycle is only a reflection of the economic cycle, monetary and financial movements reflect non-monetary and non-financial internal and international disturbances.” Suzanne de Brunhoff, Marx on Money (New York: Urizen Books, 1973), 100-01. It should be added that Keynes, too, distinguished between separate realms of industry and finance—as a complex relation where the latter did not simply “reflect” the former—in his chapter on “The Industrial Circulation and the Financial Circulation” of The Treatise on Money. John Maynard Keynes, Collected Writings, vol. 5 (London: Macmillan, 1971), 217-30. ↩ Hyman P. Minsky, “Hyman P. Minsky” (autobiographical entry), in Philip Arestis and Malcolm Sawyer, A Biographical Dictionary of Dissenting Economists (Northampton, Mass. : Edward Elgar, 2000), 414-15; Minsky, “Money and Crisis in Schumpeter and Keynes,” 115. Compare Marx, Capital, vol. 3, 608-09. ↩ See Magdoff and Sweezy, Stagnation and the Financial Explosion, 93-94. ↩ Jan Toporowski, The End of Finance (London: Routledge, 2000), 1. ↩ Keynes, The General Theory, 159. 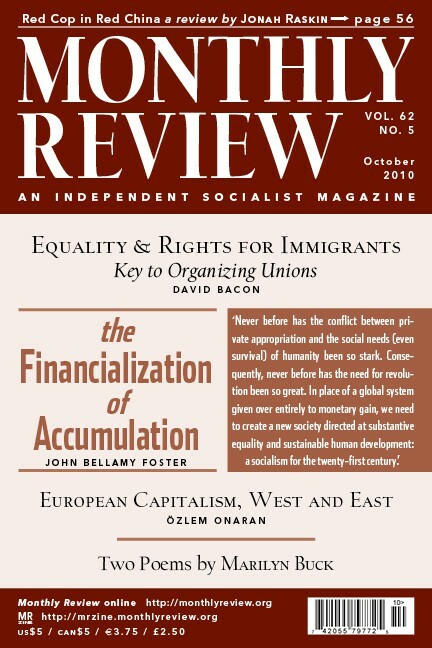 ↩ Paul M. Sweezy, “The Triumph of Financial Capital,” Monthly Review 46, no. 2 (June 1994): 8-10. For a discussion of the growing political-economic role of finance in U.S. society, see John Bellamy Foster and Hannah Holleman, “The Financial Power Elite,” Monthly Review 62, no. 1 (May 2010): 1-19. ↩ Nassim Nicholas Taleb, The Black Swan: The Impact of the Highly Improbable (New York: Random House, 2007). ↩ Nouriel Roubini and Stephen Mihm, Crisis Economics: A Crash Course in the Future of Finance (New York: Penguin, 2010), 13-37. ↩ Carmen M. Reinhart and Kenneth S. Rogoff, This Time is Different: Eight Centuries of Financial Folly (Princeton: Princeton University Press, 2009). ↩ Minsky, “Money and Crisis in Schumpeter and Keynes,” 121; also see Minsky, John Maynard Keynes. ↩ Minsky, John Maynard Keynes, 79-80. ↩ Minsky, John Maynard Keynes, 78. ↩ Keynes, The General Theory, 31, 228, 242, 249-50, 376-78; John Maynard Keynes, “The General Theory of Employment,” Quarterly Journal of Economics 51 (February 1937): 216; Dudley Dillard, The Economics of John Maynard Keynes (New York: Prentice-Hall, 1948), 146-54. ↩ The maturity argument was evident in Sweezy as early as the 1940s in The Theory of Capitalist Development (New York: Monthly Review Press, 1972), 220-21. But it took on far greater prominence in his later work beginning in the early 1980s. See Four Lectures on Marxism (New York: Monthly Review Press, 1981), 26-45. ↩ Michal Kalecki, Essays in the Theory of Economic Fluctuations (New York: Russell and Russell, 1939), 149; Alvin H. Hansen, Full Recovery or Stagnation? (New York: W.W. Norton, 1938). ↩ Paul A. Baran and Paul M. Sweezy, Monopoly Capital (New York: Monthly Review Press, 1966), 108. ↩ Michal Kalecki, Theory of Economic Dynamics (New York: Augustus M. Kelley, 1969), 161. See also Josef Steindl, Maturity and Stagnation in American Capitalism (New York: Monthly Review Press, 1976), 130-37. ↩ Toporowski argues that Kalecki and Steindl, beginning with Kalecki’s 1937 article on “The Principle of Increasing Risk,” dealt extensively with the contradictions at the level of the firm of reliance on external financing and rentier savings (as opposed to the internal funds of corporations) in funding investment. This was never developed, however, into a theory of “credit inflation” or integrated with a notion of finance as a means of boosting aggregate demand. See Toporowski, Theories of Financial Disturbance, 109-30; Michal Kalecki, “The Principle of Increasing Risk,” Economica 4, no. 16 (1937): 440-46. ↩ Baran and Sweezy, Monopoly Capital, 139-41. ↩ Total outstanding debt here includes household, business, and government (national, state, and local); Federal Reserve, Flow of Funds Accounts of the United States, Tables L.1 and L.2; Economic Report of the President, 2006, Table B-78; also see Foster and Magdoff, The Great Financial Crisis, 45-46. ↩ Sweezy, “The Triumph of Financial Capital,” 8. ↩ Harry Magdoff and Paul M. Sweezy, “Financial Instability: Where Will It All End?” Monthly Review 34, no. 6 (November 1982): 18-23, and Stagnation and the Financial Explosion, 103-05. ↩ Jan Toporowski, “The Wisdom of Property and the Politics of the Middle Classes,” Monthly Review 62, no. 4 (September 2010): 12. ↩ Toporowski, “The Wisdom of Property,” 11. Keynes himself pointed to a negative wealth effect whereby stagnation tendencies (the decline in the marginal efficiency of capital) negatively affected stock equities thereby, resulting in declines in consumption by rentiers, which then intensified stagnation. See Keynes, The General Theory, 319. Asset-price inflation, together with the subsequent collapse of the financialization era, have extended both the “wealth effect” and the “negative wealth effect” far beyond the relatively few rentiers to the broad intermediate strata (“middle classes”). ↩ Toporowski, End of Finance, 8-9. ↩ Harvey, The Enigma of Capital, 245. ↩ Raghuram G. Rajan, Fault Lines (Princeton: Princeton University Press, 2010), 8; Edward N. Wolff, “Recent Trends in Household Wealth in the United States: Rising Debt and the Middle-Class Squeeze—An Update to 2007,” Levy Economics Institute, Working Paper no. 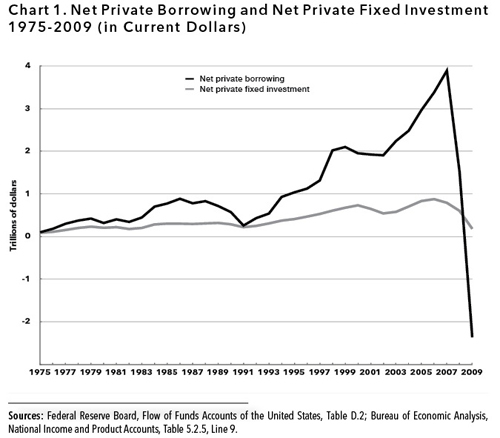 589 (March 2010), 11, http://levy.org; Arthur B. Kennickell, “Ponds and Streams: Wealth and Income in the U.S., 1989 to 2007,” Federal Reserve Board Working Paper, 2009-23 (2009), 55, 63; Toporowski, “The Wisdom of Property.” 12, 14. ↩ Bloomberg, 2010 M&A Outlook, bloomberg.com, 8, accessed 8/28/2010; “M&A in 2007,” Wall Street Journal, January 3, 2008; “A Record Year for M&A,” New York Times, December 18, 2006; Floyd Norris, “To Rein in Pay, Rein in Wall Street,” New York Times, October 30, 2009; Henry Kaufman, The Road to Financial Reformation (Hoboken, New Jersey: John Wiley and Sons, 2009), 97-106, 234. Traditionally, economic textbooks have treated new stock issues as raising capital for investment. The proliferation of merger activity highlights the fact that this is, in fact, hardly ever the case, and that most stock activity is directed at increasing financial gains. ↩ Paul Krugman, “America Goes Dark,” New York Times, August 8, 2010. The overwhelming of federal spending by the cuts in state and local spending replicates the experience of the 1930s. See John Bellamy Foster and Robert W. McChesney, “A New Deal Under Obama?” Monthly Review 60, no. 9 (February 2009), 2-3. ↩ Krugman, “This Is Not a Recovery,” New York Times, August 6, 2010. ↩ Prabhat Patnaik, “The Structural Crisis of Capitalism,” MRzine, August 3, 2010; Rajan, Fault Lines, 6. ↩ The gap between the richest and poorest country in 1992 was 72:1. Angus Maddison, The World Economy: A Millennial Perspective (Paris: Development Centre, OECD, 2001), 125; Branko Milanovic, World’s Apart: Measuring International and Global Inequality (Princeton: Princeton University Press, 2005), 40-50, 61-81; Thomas L. Friedman, The World is Flat (New York: Farrar, Straus and Giroux, 2005).